The AgriFlo Series 3 Irrigation Flow Monitor from Envco Environmental Equipment is designed for field use by irrigators and irrigation supply companies. It features a dual password system that allows irrigator access to flow data, but does not affect the accuracy of the meter. 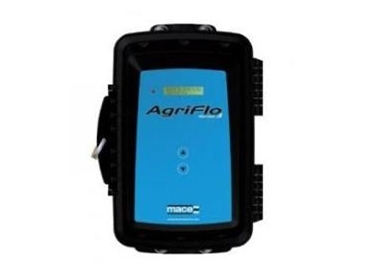 The AgriFlo Series 3 Irrigation Flow Monitor uses MACE Doppler ultrasonics to take measurements. These instruments transmit an ultrasonic (sound) wave into the water flow that is then reflected by acoustically reflective particles and then detect the reflected frequencies. The speed of the stream flow is directly proportional to the difference between the transmitted frequency and the received frequencies. This irrigation flow monitor has a range of features and benefits. One device can measure up to three flows with stream velocities of up to 8 metres per second at more than 2% accuracy. Each irrigation flow monitor includes a single full-pipe sensor that can be used in pipes from 100mm (4") to 2.5 metres (100") in diameter. A combined depth/velocity sensor can also be used in open channel or non-full pipe situations. AgriFlo Series 3 Irrigation Flow Monitors have a weatherproof polycarbonate case with the ability to be padlocked for extra security. They have a built in data logger and feature a calibration function and a choice of either solar panel or mains powered charger. These flow monitors are simple to install and require little maintenance.